The IRI RowGen GUI allows you to use real data in any field using set files. At test data creation time, RowGen randomly selects data from the sets, enhancing the realism of the test data without compromising privacy. Create set files from one or more database columns automatically. Use more than one column to randomly generate test data in joined (valid) pairs, or in "all pairs." Field values not pulled from sets are randomly generated. Generation functions respect the field size and data type declared, and values display in the correct positions. Define layouts using existing DDL or file metadata, or custom-define the layouts. You can also use RowGen to define custom data format and values. 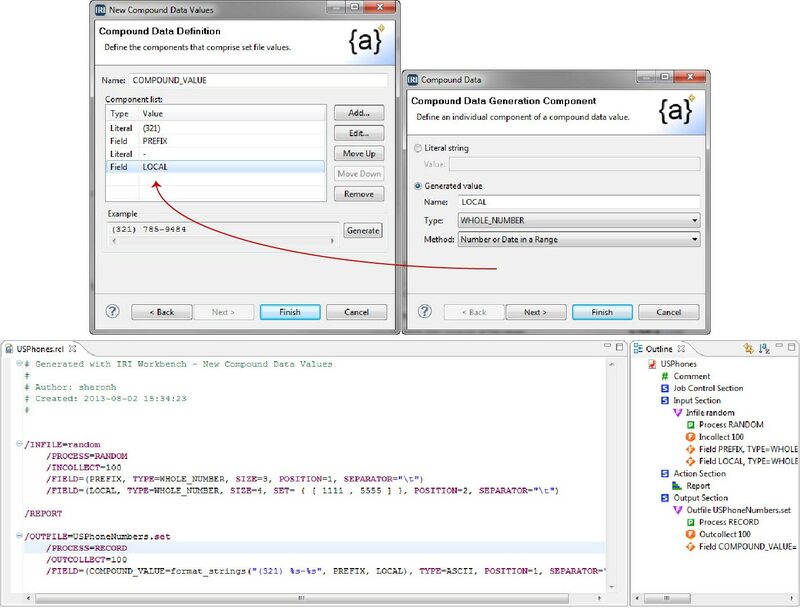 The 'Compound Data Value' wizard supports any combination of set-file or random-generated data elements and literals within new fields you construct (like master data definitions).